The Kenwood TS-440SAT is the next generation of Kenwood transceivers following on the on the success of the TS-430S. The Kenwood TS-440SAT has been designed for superior performance in the the SSB, CW, AM, FM and AFSK modes. Transmit coverage is from 160 meters through 10 meters including the WARC bands and it can receive from 100 kHz to 30 MHz. The TS-440SAT has a built in antenna tuner that will operate from 3.5 MHz to 30 MHz, and the transmitter has a 100% duty cycle of transmission on any mode for at least an hour before it needs to take a cool down break. 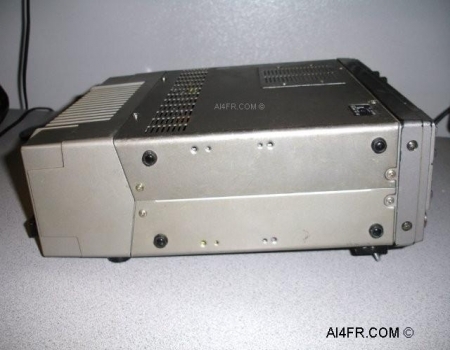 This transmitter has an input power rating of 200 watts for all modes except AM which is rated at 110 watts. 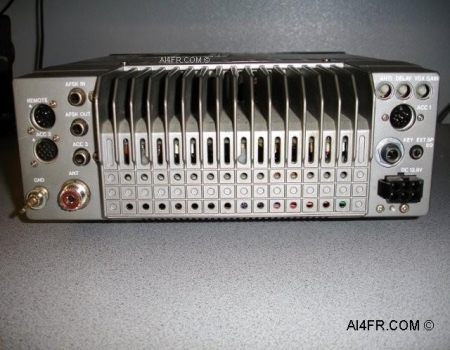 Some of the many other impressive features of the TS-440SAT include, Squelch, Notch, RIT and XIT, IF shift, AF and RF control, Speech Processor, Selectable AGC, Manual or Automatic filter selection, Split operation, 100 Memory channel scan, CW break in, and a Noise blanker. The analog meter can display RF output power, reflected power and ALC. 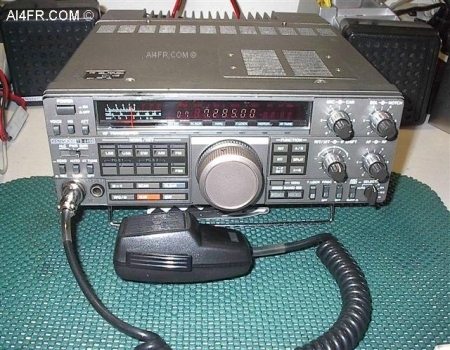 In an ending era of large transceivers such as others from Kenwood, Collins, Yaesu or Hallicrafters, the Kenwood TS-440 was and still is a perfect match for the mobile or on the go ham radio operator. Besides the digital display and automatic antenna tuner, the size of this radio was much more accommodating for under the dash installations. The size of the TS-440SAT is 10 15/16" wide by 4 1/4" high by 13 1/4" deep and it weighs in at 16.1 pounds. Take a look at the Kenwood R-5000 receiver to see how similar in appearance it is to this transmitter. The photograph on the left is showing the side of the TS-440SAT. Notice the massive heatsink located at the rear that helps allow this transceiver to achieve a 100% transmit duty cycle for up to an hour. The black item on the top of this transceiver is a switch to either turn On/OFF the VOX or to allow for Semi/Full break in while in CW mode. The photograph on the right is of the transceiver with the top cover removed. 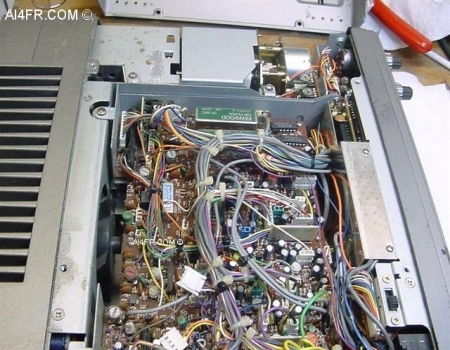 At the far side of the transceiver or at the top of the photograph is the internal antenna tuner, right below that we see the circuit board that holds the Kenwood filters.